A Plus Garage Doors also does door replacement – if you have an older door on your residential or commercial property, we would be happy to bring you into modern times with a newer door. New garage doors and garage door openers have a range of features designed to improve the safety and functionality of the door, so if you have any concerns about the safety or function of your setup, we guarantee that we can help you find the perfect system to match your needs. 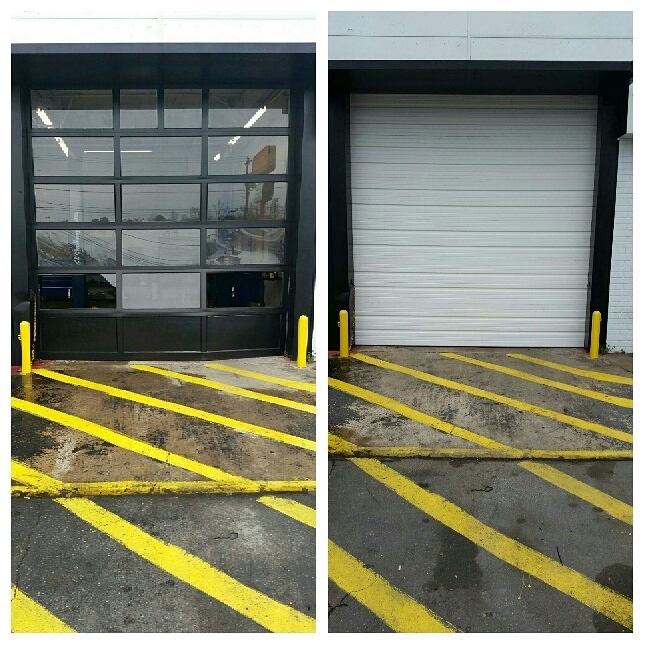 Below we have some before/after pictures of a residential and a commercial job that we did, but we have replaced hundreds of doors in and around Charlotte, North Carolina. If you have any questions about the process of having a garage door replaced with a newer option, just give us a call today – our team has the experience, the training, and the knowledge of how to give you exactly what you want out of your garage door. A Plus Garage Doors has been repairing, installing, and replacing garage doors since 1986, and there is no problem that we can’t handle. 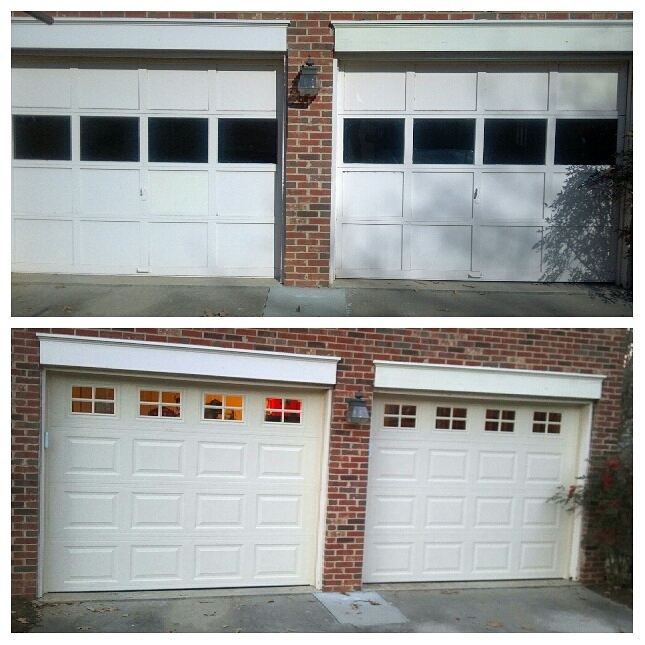 If you are looking for a Charlotte garage door replacement, we are the company to trust – we would never sell a customer something that they didn’t want or need, but if you want dependable quality and respectful service, we will be a great match for you. When it comes to garage door replacements in particular, many homeowners want a nicer looking door, or one with updated safety features. 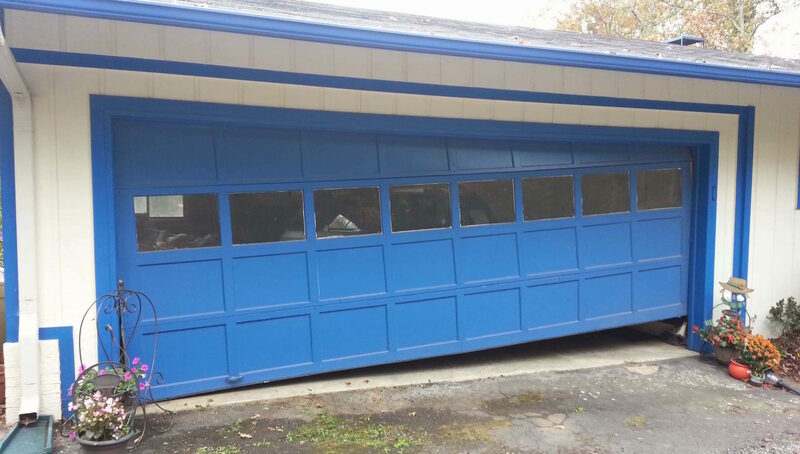 We have a range of colorful garage doors available to satisfy any taste, and if you’re more interested in a tradition white or grey door, we have carriage house, barn, sectional, and roll-up doors in a range of shades. If your door is an older model, you might want to consider upgrading to a replacement that has a better insulation rating or improved safety features. 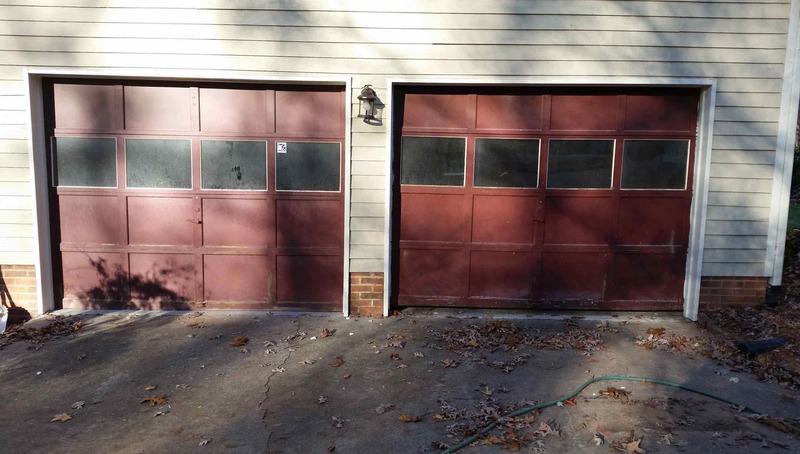 Older garage doors were made with worse insulation, and they are very inefficient compared to modern doors. If you don’t know about R-value, read our blog on the subject then make an informed decision about what door is best suited for your climate. On a similar note, if you have pets, children, or valuables in your garage, you should get informed and then make a decision based on the needs of your situation if you are replacing your residential garage door. Since 1993, all garage doors have been required to come with a sensing eye detection device, as well as an auto-reverse mechanism. If your garage door is older than that, you should consider having it replaced before it causes an injury – these doors weigh hundreds of pounds and without the proper safety measures, they could fall and crush someone or something without warning. Read our blog about checking your garage door safety features, and make sure that your sensing eye and auto-reverse are working properly. If they are not – have your door replaced today! Older doors also have fewer preventative safety measures that doors today, so if you have valuables in the garage that you don’t want an enterprising thief to access, make sure that your garage door (and the garage door opener, which can be targeted by attacks as well) are up-to-date. A final good reason to update your charlotte garage door with a replacement would be switching to a “smart” opener. Modern garage door openers connect with your phone and you can either check their status or operate them from anywhere you have reception. If you or a family member is always leaving the door open, this modern convenience might be a good upgrade for you! Broken garage door or spring? Get it replaced! Doors showing their age? Time for an upgrade!